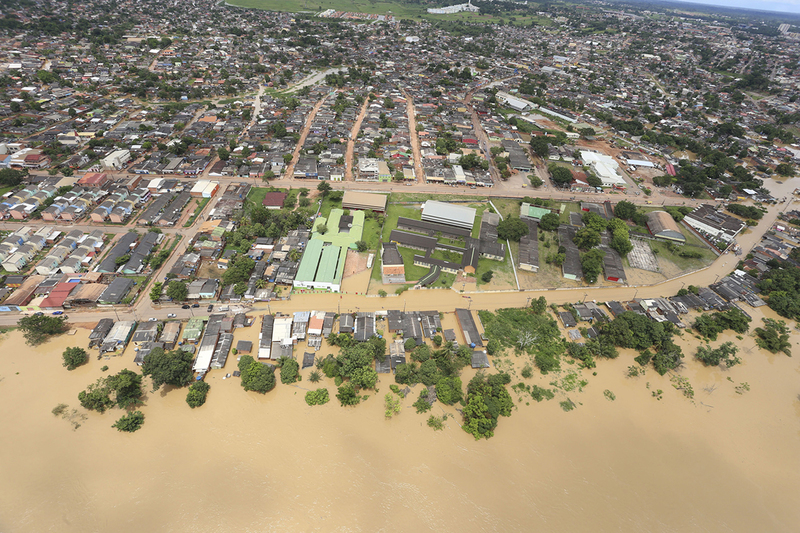 Flood affecting the municipality of Rio Branco in Acre, Brazil, March 2015. The Acre River flooded several cities in the southwestern Amazon on a scale never seen before. Photo: Miranda Secom. Latin America is often treated as a single socio-cultural entity by the international community. This generalist view has permeated disaster analysis, resulting in oversimplification of the complex environmental realities at play in different parts of the region. Understanding geoclimatic hazards and environmental vulnerability in Latin American countries is crucial to protecting human beings and the natural environment, as well as mitigating the deterioration of natural resources. A natural disaster can be defined as an extreme relationship between physical phenomena and a society’s structure and organization. Thus, environmental risks and disasters have both natural and human dimensions. Large populations in major urban centers, conflicting economies, chaotic growth of urban areas, devastation of natural resources, and a sharp increase in water and power demands are some of the common problems in Latin America. The resources available and management strategies required to tackle geoclimatic disasters, however, may be entirely different from country to country. They depend not only on economic means but also on the political and institutional capacity of each country to face the problems and to prevent and mitigate the hazards. Unfortunately, poor investments in disaster mitigation have strained resources to rebuild infrastructure, especially after recurrent events. In many Central American countries, for example, it is not a matter of whether a hurricane will hit, but of how powerful and how catastrophic that hurricane will be. In the most vulnerable countries, these concerns acutely affect the economy as each new disaster eats away at the potential for overall economic growth. Governments deploy economic resources again and again to repair the destroyed infrastructure instead of developing new projects to improve and replace the existing one. Because of their location along the Andes chain and the circum-Pacific ring of fire, countries such as Guatemala, Nicaragua, Mexico, Costa Rica, El Salvador, Venezuela, Colombia, Ecuador, Peru, Bolivia, Chile, and Argentina are susceptible to earthquakes and, in some cases, volcanic eruptions. With the exception of the 1999 floods of Vargas in Venezuela, the most devastating disasters in terms of human loss in Latin America have occurred in Haiti, Peru, Colombia, Chile, and Argentina, and were related to geologic endogenic processes, meaning those originating beneath Earth’s surface, such as earthquakes and volcanoes. The 2010 earthquake in Haiti was the most devastating such disaster in Latin American history. No one knows exactly how many people were killed, but estimates range from 100,000 to 360,000. The earthquake affected the lives of more than 3 million and practically erased the poorly developed infrastructure of the country. It is not a random coincidence that an earthquake in such a tectonically unstable area should have such devastating consequences: Haiti is one of the most vulnerable countries on Earth and stood no chance in the face of a disaster of that magnitude. In Central America and Mexico, the main disasters causing loss of human life are related to exogenic processes (those occurring above Earth’s surface, mainly floods and landslides) as well as endogenic ones. Central America is an extreme example: catastrophic flash floods in small fluvial basins, triggered by hurricanes and tropical storms, affect thousands of people in the region’s poorly developed countries. In Guatemala, for example, 40,000 were killed by flooding in 1949. Floods and landslides are common in mountainous tropical countries such as Colombia, Venezuela, Peru, and Bolivia. In all of these cases, the catastrophes largely affect urban centers located in hazardous places where basin management programs are highly deficient. Successful river engineering involves assessment by a multidisciplinary team of specialists who can evaluate hazards, impacts, and the environmental feasibility of a project. Poor river engineering has contributed to increased flooding due to unforeseen changes in the natural conditions of rivers. In Brazil, for example, landslides and floods in small to medium-sized basins affect cities, megalopolises, and industrial sites in areas located on or surrounded by a hilly relief (morros), particularly in the country’s Southeast (e.g., Rio de Janeiro, São Paulo, and Blumenau, among others). Public policies and laws have generally been insufficient to guarantee effective disaster prevention and mitigation in many Latin American countries due to the widespread political instability and corruption of the late twentieth and early twenty-first centuries. The political factor has also contributed to poor implementation of long-term and sustained national or regional disaster programs. Even when a legal framework for environmental protection exists, both citizens and government representatives typically break the law. It is common to hear politicians justify their administrative ineffectiveness by blaming climate change for the recurring disasters that affect their countries. This is a preposterous fallacy because the high vulnerability of these societies to natural disasters is mainly due to deficient public policy, not to climate change. Mass soybean harvesting at a farm in Campo Verde, Mato Grosso, Brazil. Photo © AFNR/Shutterstock.com. The concept of environmental vulnerability in a region implies evaluating the susceptibility or resistance of the area to disasters that may be caused by natural phenomena as well as human activity. Environmental vulnerability must be taken into account in all future regional, national, and local activities. In environmental disasters, the human dimension can also act as geomorphologic agent, triggering or strengthening processes at or near Earth’s surface that can have serious socio-economic consequences and affect the environmental value of a region. Many of the disasters in South America, for example, have their greatest impact on regional economies that are highly dependent on agricultural products. Drought and floods in Bolivia, floods in Argentina, and desertification and loss of biodiversity in Patagonia and Brazil are all examples. Environmental disasters have a direct relationship to the dependency of Latin American economies on basic extractive commodities (natural resources such as agriculture and cattle ranching, oil, gas, and mining) as they produce large-scale environmental impacts. One of the most crucial challenges faced by Latin American countries is not just disasters affecting society in a direct way, but the accelerated environmental deterioration of their natural resources. Estimates of numbers of people affected by environmental disasters are usually accompanied by estimates of economic loss. However, these economic values underestimate or exclude environmental disasters such as the desertification of Patagonia, the expansion of the agricultural frontier (and loss of biodiversity) in Brazil, and the contamination and poor management of water resources or glacier recession in the Andes, to mention a few. In Argentina, the impact of land-use changes over time has been dramatic. Because of Patagonia’s historical socio-economic underdevelopment and underpopulation, its shameful desertification is treated as an anecdotal episode in the environmental policy of Argentina. This environmental disaster is now repeating itself with the destruction of the Chaco and the sub-Andean forest along the socially and economically underdeveloped corridors of the country in the northwest and north. Colombia is another example of self-destruction in the wake of a myopic dream of economic development. Its rates of deforestation are among the highest in the world: although it represents about 0.1 percent of Earth’s land, Colombia contributes approximately 5 percent to global forest loss. 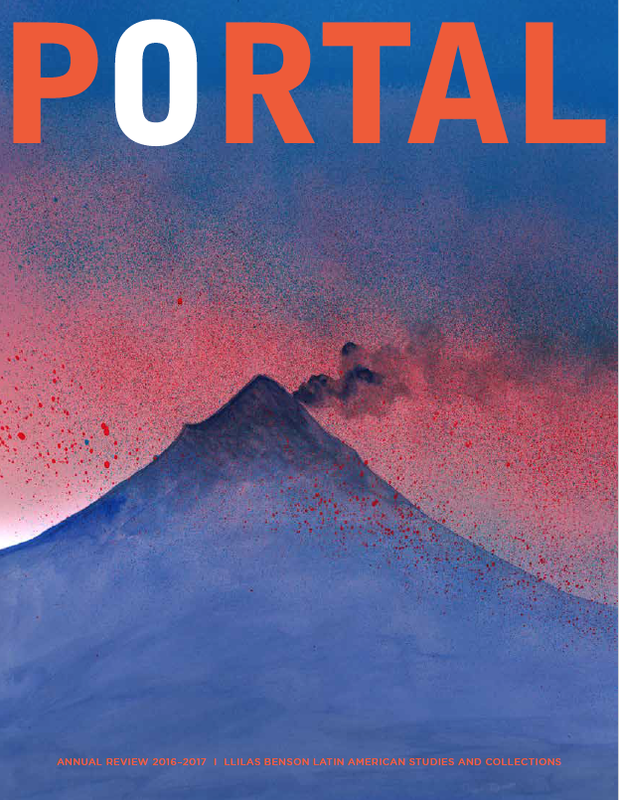 Both mining and the destruction of some of the most important coral reefs in the Caribbean exemplify the dramatic environmental situation of Colombia, as described in an article by Juan Restrepo published in Portal (2012). A superlative example is Brazil. With a total of 8.5 million square kilometers of area and around 200 million people, Brazil is considered one of the largest agricultural producers in the world for its widespread cultivatable area and intensive water management practices. With the dimensions of Brazil’s territory and its large economy, the tremendous impact of agriculture in recent decades has no comparison elsewhere on the globe, and is not without consequences. During the coffee booms (1840–1930) in Brazil’s Southeastern states (São Paulo, Paraná, and others), the once vast Mata Atlântica, or Atlantic Forest, was heavily deforested. Subsequent urban concentration, sugar cane plantations, and timber extraction contributed to the deforestation of 97 percent of the original total area of the Mata Atlântica biome. More recently, around 80 percent of the Cerrado biome, the Brazilian savannas—once an expanse of more than 2 million km2—was practically erased from the face of the Earth in the space of a few decades. Contrast between a remnant of Cerrado vegetation and an area deforested for soybean production in central-western Brazil. Photo © Adriano Gambarini / WWF-Brasil. 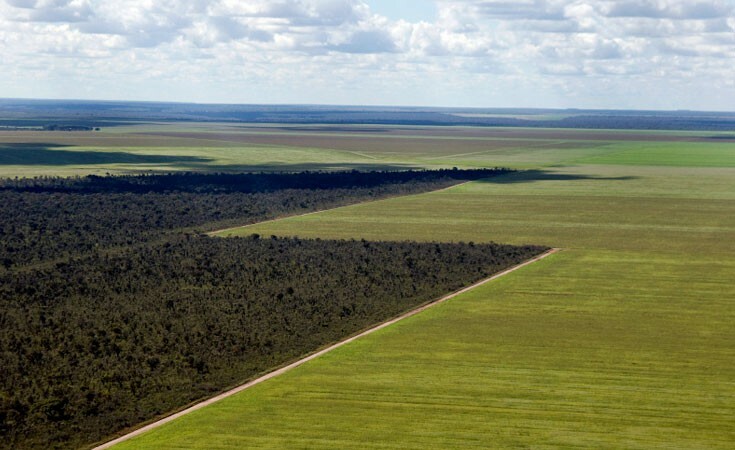 It is shameful that the environmental catastrophe of the Brazilian Cerrado has been largely ignored by the national and international community. The Cerrado region is presently the largest cultivator of soybeans and sugar cane, responding to increasing world demand, mainly by China. Brazil planned to source 10 percent of the world’s fuel with bio- or agrofuel in the near future through sugar cane, but the collapse of the international market for biofuel and the deceleration of economic demand by China shows the weakness of this unsustainable “locust” model, which in record time cannibalized one of the richest areas of biodiversity on the planet. Unfortunately, the “successful” yet unsustainable Brazilian model of large-scale soy production for export seems to be the one now being imitated by Colombia in its Llanos Orientales, where landowners with large capital are starting to exploit the region in areas that lack specific environmental planning. South America’s rivers are particularly rich natural resources. Six of the world’s ten largest rivers, in terms of water discharge, are located in South America, and many other of the continent’s rivers rank among the planet’s largest. These rivers also provide home to the most diverse alluvial forests and host the highest biodiversity of fish. With their abundance of rivers, tropical countries are increasingly turning to dam construction to generate hydropower, in contrast to current trends in developed countries to remove dams. A main engine of this aggressive energy policy has been the Brazilian government. Of the numerous projects under construction or planned in Brazil, Peru, Bolivia, and Ecuador, several are financed, or will be, by the BNDES (Brazilian Development Bank) and some by Chinese capital (see the article by Ruijie Peng in this issue). In the case of Brazil, hydropower has been a main source of energy. As a consequence, many of the country’s large rivers, such as the São Francisco and the Upper Paraná, have been irrevocably altered by dam construction. In this context, the current environmental debate on climate change and greenhouse gas emissions has been manipulated by political and economic forces. Hydropower is rationalized as being clean energy whose production is less detrimental to the environment than that of fossil fuels. Indeed, within the debate on climate change at the Intergovernmental Panel on Climate Change (IPCC), a major concern about dams in tropical areas centers on their production of enormous amounts of methane, a greenhouse gas linked to global warming. Yet this debate does not focus on how much damage they will cause the environment. Amazon basin countries insistently defend hydropower as a source of clean and sustainable energy. In fact, Brazil, Peru, Ecuador, Bolivia, and Colombia have plans to build, in record time, more than 260 dams among them. If their construction plan is accomplished, the whole basin will be impacted in just one generation. Unfortunately, what is not discussed is the irreversible damage that dams can wreak on the hydro-physical environment, aquatic ecosystems, and regional or local fluvial socio-economies and cultures. Worse, in the case of mega-rivers, there is little discussion of the domino effect produced by dam disruptions. The Amazon basin faces dramatic environmental consequences that will surpass the regional and continental scale, triggering global repercussions. The impact on sediments will be catastrophic for floodplain ecosystems, with decreased sediment load and fewer nutrients arriving to the Atlantic coast of northern South America. There is even a potential impact on inter-hemispheric climatic teleconnections—phenomena felt over a range of thousands of kilometers—with effects that could reach the Caribbean zone and the southern United States. These major factors are reason enough to recognize that the imminent impacts of dams in the Amazon basin cannot be compared to any previous river regulation project in other parts of the world. Far from learning the lessons from the past, humanity is now irresponsibly playing with the largest and most environmentally strategic fluvial system on the planet. But as Latin America’s economic development means that energy demand is increasing every day, how to reconcile these issues? The justification for large-scale hydropower and agricultural projects is the belief that no other options exist that will serve economic growth and development. Yet such political solutions become irresponsible when they consider only the technical aspects of project scale and not the consequences. In the case of electric power, why is the building of large dams considered the only option? Why not design and build a more complex and interconnected system of hydroelectric and other sources of energy closer to consumers, with less environmental impact? One such solution would be to improve and diversify electricity generation in small- or medium-sized basins with less natural and cultural value. 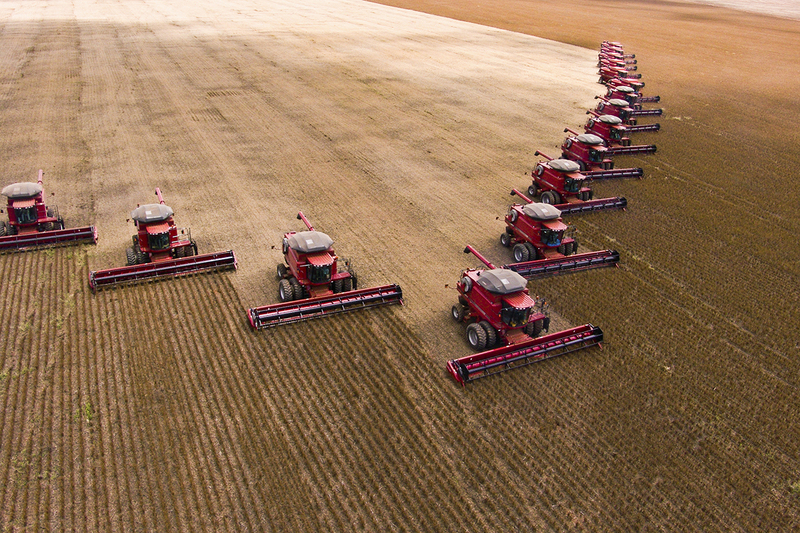 In the case of agriculture, why do we consider our only option to be the one that erases some of the areas of greatest biodiversity simply because for one or two decades it has become a good deal to export soybeans to China? Edgardo Latrubesse is professor in the Department of Geography and the Environment and affiliated faculty at the Teresa Lozano Long Institute of Latin American Studies. 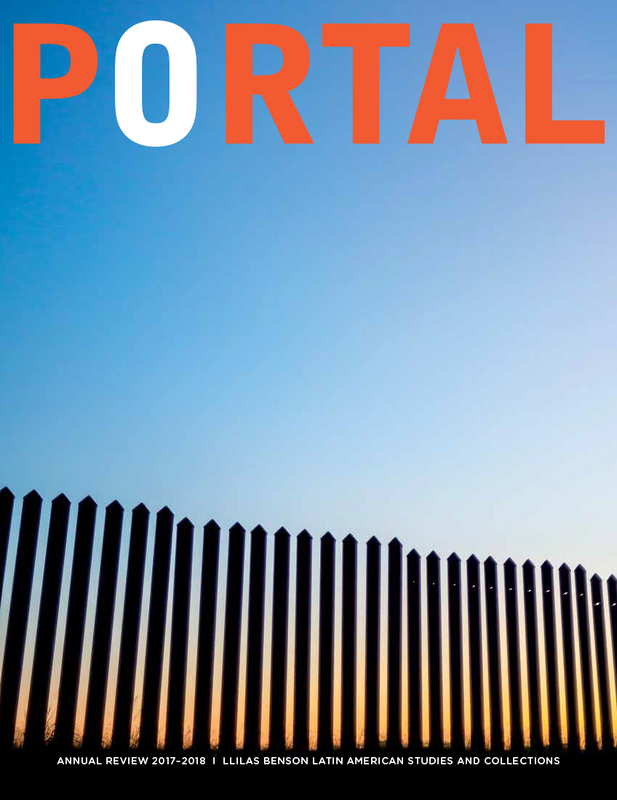 This article was originally published in print in the 2014–2015 edition of Portal. Latrubesse, Edgardo. 2010. Natural Hazards and Human-Exacerbated Disasters in Latin America. Oxford, UK: Elsevier. Restrepo, Juan. 2012. “The Perils of Human Activity: Lessons from Colombia’s Experience with Soil Erosion.” Portal 7 (2012), 38–40.